Today we are here to talk one string trimmer in particular. You know, those hand held poles with a motor and a spinning piece of cord at the bottom which is used to obliterate grass and plants alike. They can be some very handy tools to use both for home gardeners and professional landscapers too. There are some important features that a string trimmer or a weed eater needs; some of them we will be discussing today. 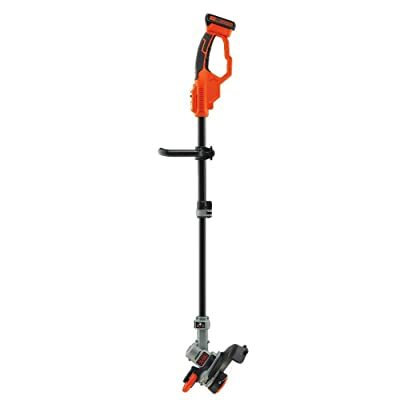 Let’s get on with it and talk about the Black & Decker LST420 Trimmer. 2.2 Extended Battery – Times 2! One of the problems that many trimmers have is that the motor is not able to deliver enough power down the shaft to the cutting head to due power loss with the distance from the motor to the cutting head. This is not the case with the high performance power drive transmission makes sure that there is minimal power loss when transferring the energy from one place in the trimmer to another. This is really great because it means that the fuel to energy ratio is as even as possible with as much of the fuel and energy being converted into usable power as possible. We all know that different jobs do not only demand different tools but it also demands that those tools be flexible in what they can do. Sometimes you need the trimmer to cut small things but you need to do it for a long time which means that you need more battery life. And sometimes you may not need to use very much time trimming but the brush and bushes you are trimming require more power from the trimmer to get through. That’s why the Black & Decker LST 420 has a dual mode accelerator which means that you can choose between less power and more battery life or less battery life but more cutting power; this is all thanks to patented Runtime Extension Technology. It’s a very versatile tool that will fit your needs whatever they are. A really great feature about this Black & Decker high performance trimmer is that it has an automatic spool feed. People who have used string trimmers before will know how hard it can be to get more string out from the spool once the string you are using breaks off. That once again is not the case with this particular model of trimmer because the automatic spool feed means that you don’t have to bump, push, and twist endlessly to just try and get some more string out. With the simple push of a button the Black & Decker will keep feeding string until your job is done! Extended Battery – Times 2! Something that is really great about this particular trimmer is that it has an amazing battery which means that you will never run out of power before you get the job done. The 2.0 Amp lithium ion battery means that you can get up to 2 hours of runtime with each battery charge. And even when you do have to recharge one battery the beauty is that this model comes with 2 batteries just to take care of that issue! One of the other great things about this trimmer is that it has a 12 inch cutting swath which means that you will have to spend less time hauling around a piece of machinery. Even though this tool actually only weighs 5.7 pounds; it’s very light and easy to carry around making it great for even the smallest of people to operate. So, as you can see there are many pros to this tool however there are some cons too. One of these cons that it is not gas powered and therefore will not provide as much power as a conventional gas powered trimmer; not only that bus gas can simply be refilled from a canister whereas a battery needs to be recharged for several hours. Other than that there is nothing wrong with this tool. It has great battery life, good power, it’s light weight, and easy to use!